Mozart's great concerti of 1784-1785 represent some of his most sublime music; it was with these works that his mature concerto style emerged. Completed late in 1785, the Concerto in E-flat Major, No. 22, KV482 was very successful at its premiere, and has remained one of Mozart's most popular to this day. While the opening and closing movements are filled with wonderful themes and orchestration, it is the central Andante that has brought this concerto its largest amount of fame. The use of clarinets and bassoons paints a marvelous portrait against which the piano soloist can evoke a tremendous amount of magic. It was this movement which was repeated twice at the audience's demand at the work's premier. This edition includes two compact discs with a complete performance of the concerto by Iliana Todorova and the Rousse Philharmonic Orchestra under Nayden Todorov, plus a second recording minus the soloist, thoroughly indexed for practice and performance convenience, with a 20% slow-tempo practice version. 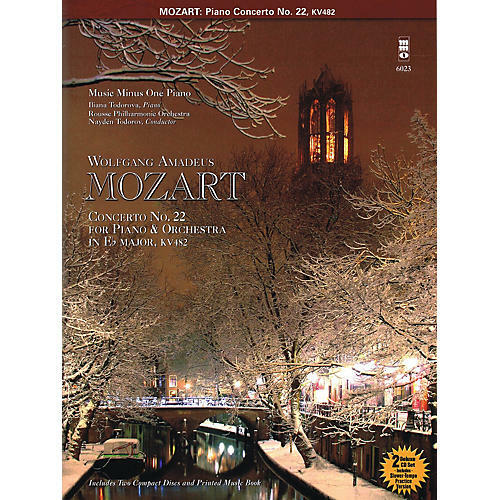 Includes an authoritative piano score with two cadenzas by Johann Hummel and on by Ms. Todorova, with a reduced-size orchestral reduction below for easy performance and study, newly engraved and printed on high-quality ivory paper.